In 1858, the Blessed Virgin Mary appeared to a young peasant girl named Bernadette in Lourdes, France. Through Bernadette (St. Bernadette), Mary revitalized the faith of millions, and continues to do so. We will start praying on February 2nd! The devotion to Our Lady of Lourdes is most well-known for the miraculous cures and healing of illness & disease. So one of the intentions we will pray for throughout this novena is for healing. In one way or another, we are all in need of it, especially before we reach Heaven — whether that healing is for one of our sins, or healing of our infirmities. We will also pray for the conversion of sinners, including ourselves. This was an important intention in Bernadette’s life, and she offered up much of her physical suffering for this cause. And lastly, we will also pray for the faith of those who have fallen away from the Church, for those who are lukewarm in their faith, and for greater faith to be practiced within all families. We hope you will join us in praying this novena, and that you will share it with all of your friends & family. The feast of Our Lady of Lourdes is on February 11th, which was also proclaimed as World Day of the Sick by St. John Paul II. We’ll start praying on February 2nd. That’s this Saturday! We’re looking forward to praying with you and for you! Pls pray for my son who is going thru extreme struggles, one disappointment after another despite all his effort. He just lost one of his jobs. Rent, student loans, etc due and will not accept family help. Homelessness soon if he doesn’t get an adequate job.Please pray. He doesn’t. He no longer Believes. I pray for the health and happiness of my parents,and my family and my professor and family.I am in Albi now .I pray to help me to come to Lourdes as I find it difficult to make arrangements by myself. Thank you,I JUST WROTE THE ABOVE LINES AND AFTER WENT FOR SOMETHING. NOW everything is booked with the help of a nice girl.I hope I can see the place and enjoy. For Karen, that she will get all of the scholarships that she needs for college. Please pray that God helps me through this year of study. I also pray that I find employment, I pray for my sister who is ill that God’s healing hands will enfold her. I am in need of directions in my life. Please help me pray for my mother whose death anniversary is 2 March. I believe that she is with our Lord and in the company of angels. Please pray that I forgive my former employer and move forward. Thank you Blessed Mother for healing I received! For our grandchild in the womb that he/she is safely delivered in July. This precious baby has two wonderful parents that have waited 9 years for this amazing child. In Jesus name we ask for blessing on this mother and child. Dear Holy Mother Mary, please petition the Good Lord, Your Son Jesus Christ, on my behalf that my bank will immediately refund all of my money, which this banking fee was charged to me and my bank account in error, etcetera…, back to my bank account and that all of my money will immediately be made Available for me and my own spending again right away – for I desperately need all of my money; because I am already experiencing financial difficulties. Amen. Please lord, somehow repair the damage that was done thru Peachtree. Please let flip take this on. Please lord help me find a roommate that has integrity and character, soon please. Please watch over Ethan help him make good decisions. I pray that peace may begin with me and extend warmly to Becca in her time of need, to Jimmy as he questions his faith in God, and to Sharon and Gail in their time of anger. May I remember to put all my concerns and resentments in the hands of God and never doubt His ways. Mother Mary please intercede on my behave, to grant my marital settlement this year and that after my youth service that my office may retain me. I also pray for all the since all over the world using my sister CHINYERE as a point of contact that may you show them mercy and grant them healings. And that may you restore peace in our country Nigeria. All this I ask through Christ our lord Amen. For my daughter, that she will overcome her depression and anxiety and flourish in society and be able to support herself financially with a job that she loves and that provides great health insurance for her needs and hopefully sometime soon after or before graduation this May. Complete and permanent healing of all cancer my husband has. Please pray that my child will recognize their depression and accept the help being offered and find a way to overcome. They have pulled away from the family and we deeply miss the family bonds and simple conversations and particularly the laughter. Please pray that my spouse and I will continue to be strong emotionally and mentally while faced with business challenges and family matters. Dear Lord and Blessed Mother! Thank You for all Your blessings! Thank you Blessed Mother for your prayers and intercessions. Please pray for my son and all my family. Please pray for all who also prayed this novena. I pray that r.h. is cured of throat cancer and has the least amount of short and long term effects possible. please help him with ringing in ears, sore throat and tongue, inability to taste, fatigue. Yesterday On the ninth day of this novena, after having prayed it, we got a call while at mass for my son who wanted to come over and speak with us. 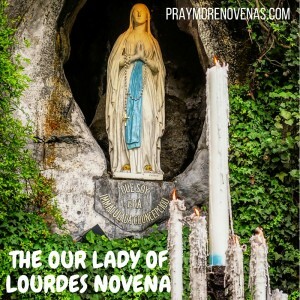 I had offered this novena for he and his wife so that they would become pregnant. They came over and told us that she had a positive pregnancy test that morning. They had been trying to have a child for five years. Praise God. Successful healing from my husbands surgery leading to less pain and a better quality of life. I continue to pray for good health and financial stability for everybody in my family. I pray for my elder daughter to heal from all her health problems, to be blessed with a healthy child soon and a very prosperous business. I pray for my younger daughter to be healthy, to be blessed with a healthy child soon and a very successful career and for her husband to get a job with M and be very successful. I pray for my nephews to be healthy, to have good jobs and good wives and children of their own. I pray for G to heal from all his addictions and to turn his life for the better. I pray for my sister to be healthy, to keep her job and to have grandchildren from both her sons and for my mom to be healthy and happy. I pray for my husband and me to be healthy, to be blessed with grandchildren from our both daughters, to keep our jobs and to pay off our debts soon. I also pray for the intentions of all who are praying this novena. Amen.